Who you got? Annual huge rivalry. I have both teams being close this yr. i believe when its all said and done, the coo wins by 10. 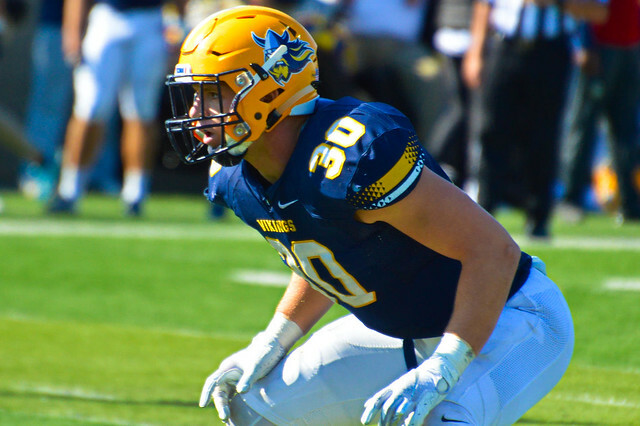 Augie has better skill kids on offense plus a very good oline. Defense is a bit improved from last years. USF has a defense that is very young and unproven but talented. The offense with skill players are better than last years, making me think the will pull it out. article about USF RB Gabe Watson. on his way too All-American? Really an intriguing game. AU sports the #4 offense and #11 defense, USF has #9 offense and #3 defense. USF has #1 rusher, AU has #2 passer. 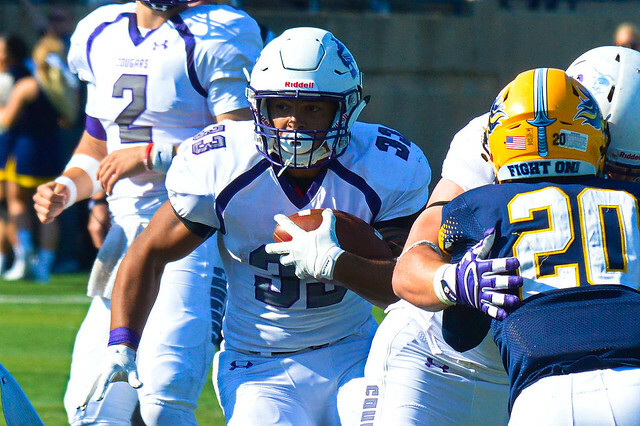 Augie has #2 rusher mostly due to a porous Wayne defense that gave Rudy Sinflorant 235 yards. Hard to believe this won't be a excellent contest. Augie does have an advantage in special teams. 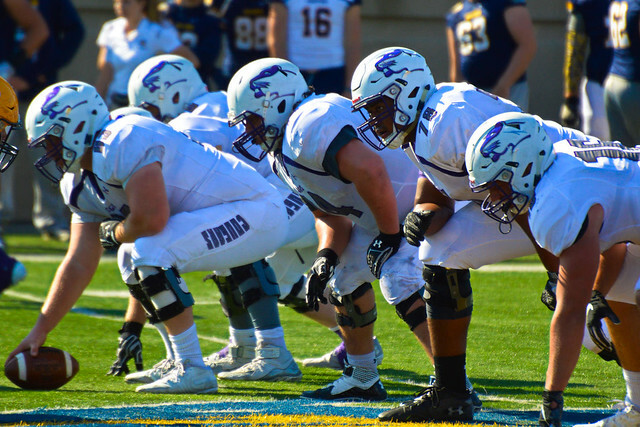 Generally I believe teams with good D and strong running game win, which would point to the Coo. Augie by a touchdown. Usf up 17-0. Watson having a field day. If someone at Kirkeby-Over wants to let the Vikings know they have a game today, that would be great. Thanks. Ya idk what's going on. Imo augie is a lot better than they are showing today. But I also believe usf is a top 15 team... so let's see what both teams do for the rest of the year. USF played it's best game of the year, much more physical than AU. your QB was sharp, the Coo ran the ball with authority and special teams played well. The bad 16 penalties for 175 yards and 7 personal fouls with 1 ejection. I'm sure coach Andersen will address that. Augie puts out 496 yards and is gifted 175 penalties yards and scores 13 points WTH! Our QB starting with the 2nd half of the Wayne game and all of the USF game reverts back to last year inaccurate passing 4 int. and he cannot scramble. AU needs to go another direction at QB starting next week. Hard to remember how many time in the red zone walking away with no points. The Cougars came to win and played with like a conquering army. AU started flat the 1st Qtr. Coaching? If the Coo can play the rest of their games with that much focus, determination and energy they will not lose another game. Last edited by vikingfaithful; 09-23-2018 at 09:46 AM. USF played it's best game of the year, much more psychical than AU. your QB was sharp, the Coo ran the ball with authority and special teams played well. The bad 16 penalties for 175 yards and 7 personal fouls with 1 ejection. I'm sure coach Andersen will address that. Some things I noticed. You guys have a lot of talent on offense..... I expected a game more like 35-24. But this usf team is very deep. Maybe 5-6 decent rbs, 3 decent QBs, and wrs. But I dont know about their top end talent yet. Hey VFaithful. Glad I got a chance to meet you in person today! It was great meeting you as well and seeing my bud Matt. Not a whole lot of us D2 super fans and is good to know each other. 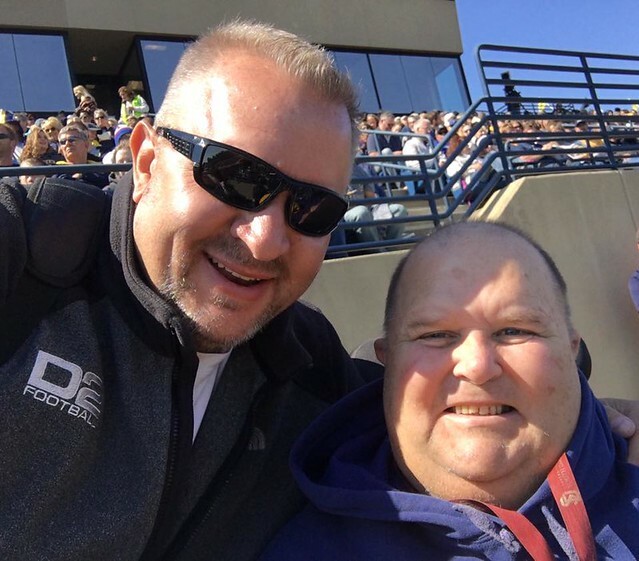 For those that don't know Mike (Vikingfaithful)....he's at all the Augie games and sits at the 50 yard line in the middle area, as he's in a wheelchair, in the handicapped area. When I first arrive at KO, once I get inside the stadium he's the first person I look for before going field level to view the action. Each team should be so lucky to have a fan like Mike who cares greatly for his squad....while he doesn't live in the Sioux Falls area....and makes quite the effort to attend games. I've said this before, but I consider those on here as "board brothers", and that especially rings true with Mike, Tundra (Terry), and Laker (Brad). As for the game....here are a few pics I took during the contest. Admittedly, I was taking video as well for those keeping up on Twitter as well....so I didn't got a ton of pics. Great post! A little behind the scenes about NSIC superfans, appreciate this. As for the game....I've said this for years now, but I really believe it. During the NAIA years USF always heard about how they wouldn't fare well in D2 if they played at the same level with Augie..or if they met, head-to-head. That's fueled the Cougars staff (who's always had someone around from those days)....and especially when they're at the KO, they play with passion and a chip on their shoulder. 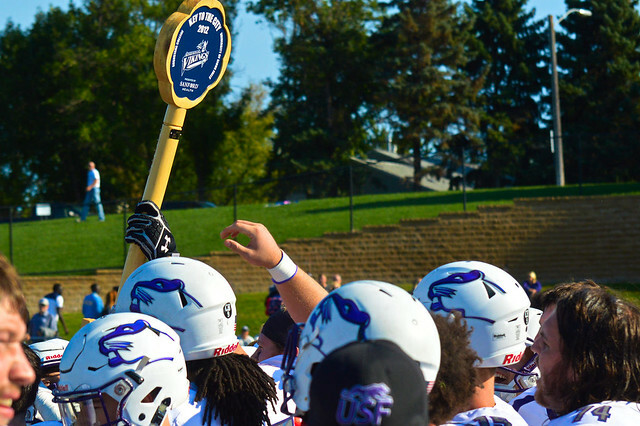 During the series USF has played with a certain fire at Augie. I've been at all of these games, up close....I see it. I think the Vikings have a hard time matching their intensity....the rivalry just seems more embraced by USF and the games just feels like it means a lot more to them. I'm not saying Augie doesn't want to win the game....of course they do....I just think it's a really huge deal to USF, every single time. 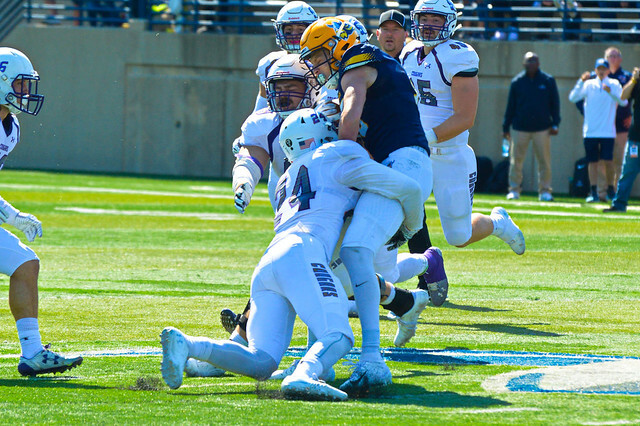 The year Augie won, CJ Ham willed them to victory and he looked very determined to beat the Cougars after years of being on the wrong side of the score....and Brandon Mohr showed that same type of determination with his 2nd half effort in the win. The game itself....I certainly didn't see 37 points in the first half as being realistic....big kudos to USF for their mixing run and pass, showing this offense can be dangerous and explosive. Most impressive half in the history of these rivalry game. If USF can show this type of balance, they'll be a top NSIC squad down the stretch. Their D was able to bend when they had a big lead, but then not-break in the red zone....keeping Augie from getting shots downfield and in the end zone. I thought Saddler looked confused with what he was seeing on Saturday..and the interceptions speak to that. I'll be interested to see how Augie responds in the coming weeks after such a deflating loss. Certainly Crookston should be a get-right game..I know UMC won....just sayin tho. USF at Bemidji in 2 weeks will be interesting.. The only person more shocked than me when I heard the halftime score was Captain Renault in Casablanca when he found out that there was gambling going on in Rick's. I thought that this would be a close game. Yes, the USF at Bemidji game will be very interesting. As for the game, this performance by the Coo was completely unexpected by me but I couldn't have been prouder. There are still special teams issues to work out, that much is clear. Heck, I didn't want to say it out loud for fear of jinxing the Coo, but I had this awful fear that I was going to witness the 2012 game in reverse at KO. Thank you for not doing that guys. But they will cost us games if we cannot clean them up. The snaps Tundra mentioned previously were awful. It was a joy to watch Watson live and they've made huge strides since the CSP debacle in week 1. These highlights from local SF TV station KDLT were like drugs in my veins this weekend, namely Watson's spin move. Augie fans, NSFW. As to Witt's point about the intensity of the rivalry, my answer as a former player who played in these games as well as the NAIA is, he's absolutely right. One reason I came back to SD this past weekend and not this coming one was because of the chance to watch this game. OJ year after year in his interviews about this game tries to treat it just like any other game. Which I find humorous considering in 2015 he was a entirely different post-game interview following their, well-earned, victory. I get OJ is a coachspeak master, but treating it like any another game likely fuels the Coo even more. Just an observation. USF has always been a program, heck school, with a chip on its shoulder. This game is just an embodiment of that. Coach A being part of the old NAIA guard understands this better than anyone. This game is truly for "those before who came before us." All those years of people poo-pooing our NAIA titles, teams, etc. Coach A discussed this in this podcast with the local radio station before the game... https://kwsn.com/podcasts/sports-tal...the-city-game/. And the 'rivalry' always seems to play out more off the field amongst the fans. Which is great because the game is always well-played and clean for a rivalry game. 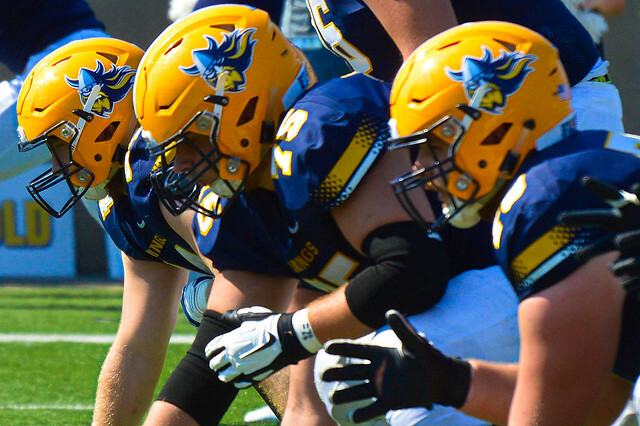 I had nothing but respect for Augie players, knew a lot of them personally, they were not even close to my least favorite team in NSIC to play. For example, as someone who is now also a fan of a struggling FBS football team, I've caught myself saying "wait til basketball or baseball season." And immediately kick myself because "i sound like an Augie fan." Augie students chants or signs about USF students working at McDonalds or 'working for them someday' is petty and CFB to a T. Really generalizing here, but it works because Augie runs on seeing themselves as above USF (now possibly chasing after who they feel are their real peers in D1), and USF will embrace the taunts and such as even greater motivation for that chip on their shoulder. But it's mostly all in good fun and it's that kind of stuff that makes college football awesome. Heck of a game, thanks for the hospitality AU (VF, sorry I wasn't able to make it over! Got busy catching up with old friends and family), but the key is just one game and there's a lot left to play for in this wide open NSIC. Last edited by Otis Day; 09-27-2018 at 11:18 AM.